I made a pledge to make by kitchen habits more sustainable. 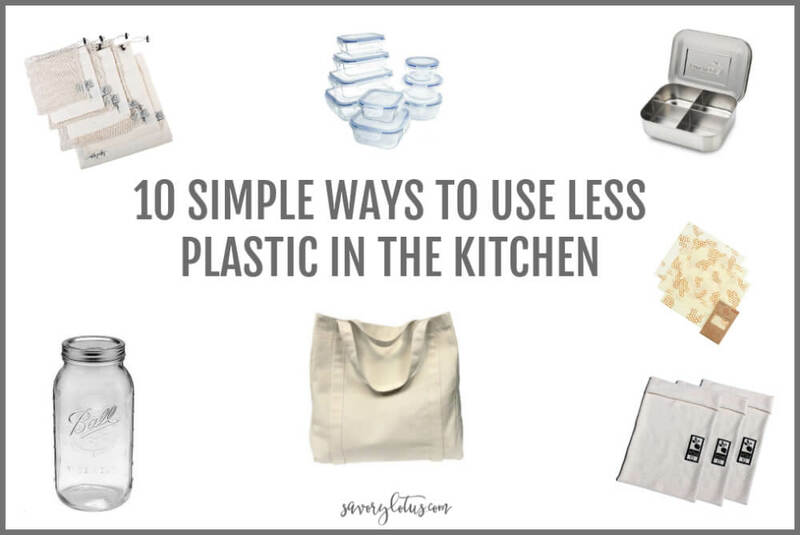 Here’s 10 simple tips on how to use less plastic in the kitchen. Plastic pollution is a big deal. Only 1 to 3% of all plastics used are recycled. The US alone throws away enough plastic bottles in a week to encircle the world 5 times. Most plastic products contain a chemical called Bisphenol A (more commonly referred to as BPA). BPA has been linked to cancer as well as reproductive problems. Americans recycle at the sad rate of 34.5% and recycle plastic packaging at the even sadder rate of 14%. So the majority of that food packaging is ending up in landfills. Last year I made some shift in my food and kitchen habits to dramatically reduce the amount of plastic that I use in the kitchen. And turns out that it was way easier than I thought. 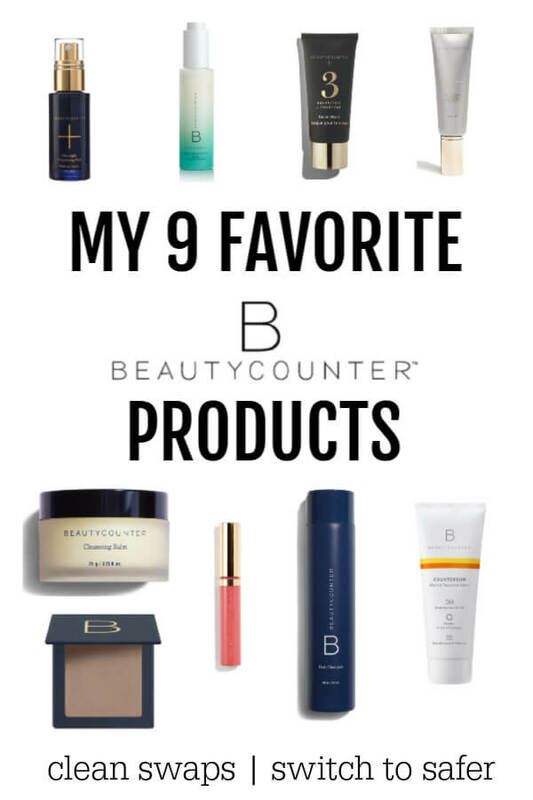 I invested in a few new products, and I changed a few of my buying habits. And now very little plastic shows up in my kitchen. Plastics are convenient. I totally get it. But we are at a point in time where shift has to happen. And every choice we make counts, no matter how small. 1.Bring your own bags: Skip the plastic grocery bags by bring your own canvas totes with you when you shop. Many stores sell their own with their logos on them. You probably have a few already laying around. Get in the habit of using them every time and return them to your car after you unpack your groceries. 2.Bring your own reusable produce bags: I invested in a set of produce and bulk item bags from Earth Junkie. I use them instead of plastic bags to buy my produce and bulk items. There are seven different bags of various sizes. 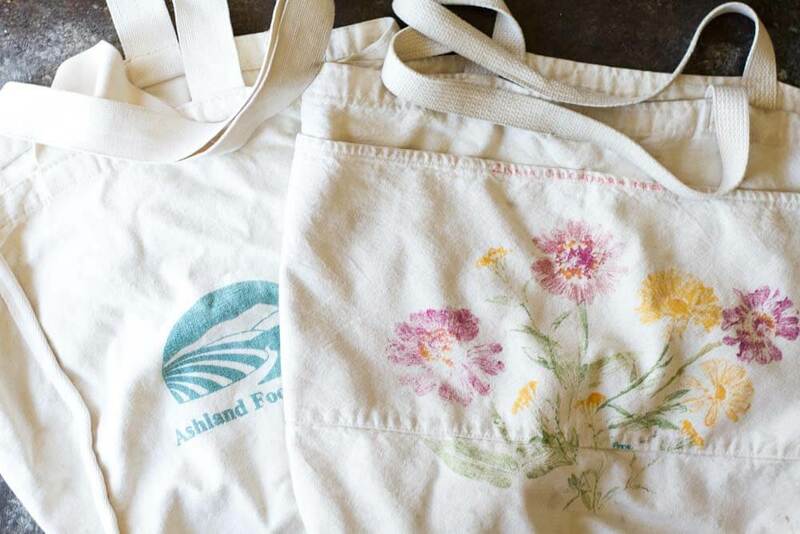 You can also easily make your own from old cotton pillowcases or extra fabric. 3. 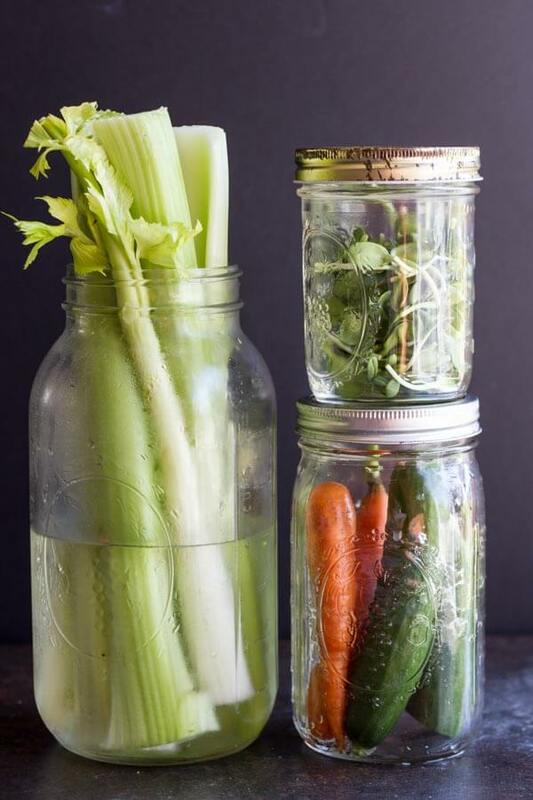 Store your food in glass jars: After bringing my produce and bulk items home, I remove them from my Earth Junkie bags and store everything in glass jars. I have a ton of wide mouth quart jars and half gallon jars. I no longer use plastic bags to store my produce in the fridge. Broccoli florets, brussels sprouts, strawberries, blueberries, green beans, carrots, cucumbers, sprouts, and radishes all go in glass mason jars in the fridge. They are all lined up on the bottom shelf ready to use. Celery gets trimmed and placed in a tall half gallon mason jar half filled with water. It stay fresh for days. In general, since using the glass mason jar method to store veggies, my produce stay fresh much longer. Unwashed strawberries stay fresh for over a week. 4. Store greens in a wet terry cloth bag: Storing lettuce and greens was my biggest challenge. Until I discovered the organic cotton Vejibags. I was a little hesitant to store my leafy greens in a wet bag in the fridge, but guess what? It’s amazing. My lettuces and kale and chard stays fresh for so long. No wilting. No slimy produce. No soggy greens. 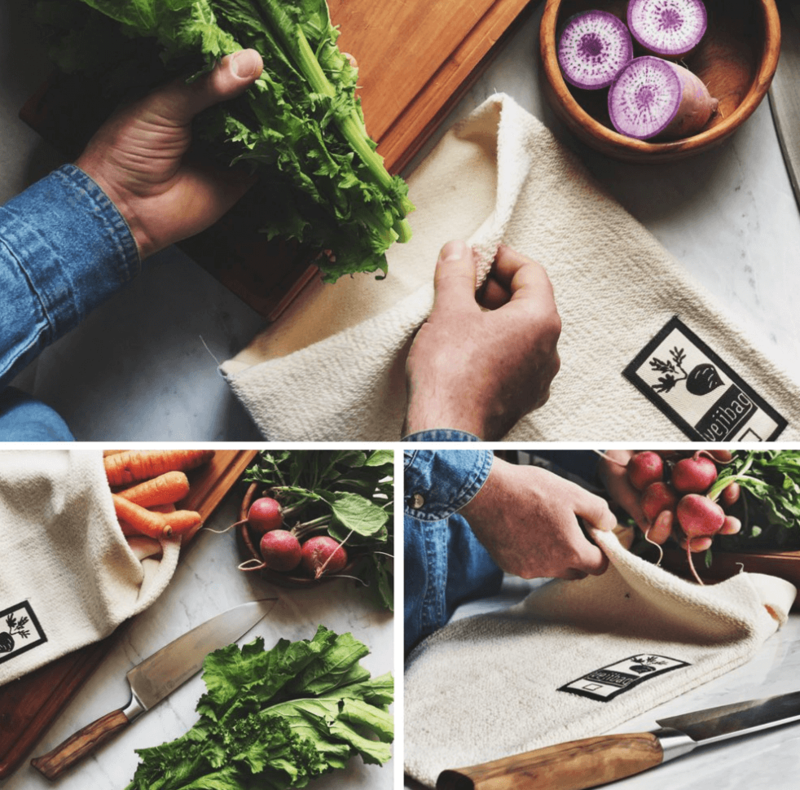 Just wet the bag, wring it out, and place your produce inside. The Vejibag creates a humid environment that lets vegetables breath. Vegetables remain crisp and vibrant for twice as long than if stored in plastic. I did a little test and found that my chard stayed absolutely fresh and crispy for 11 days in my Vejibag. 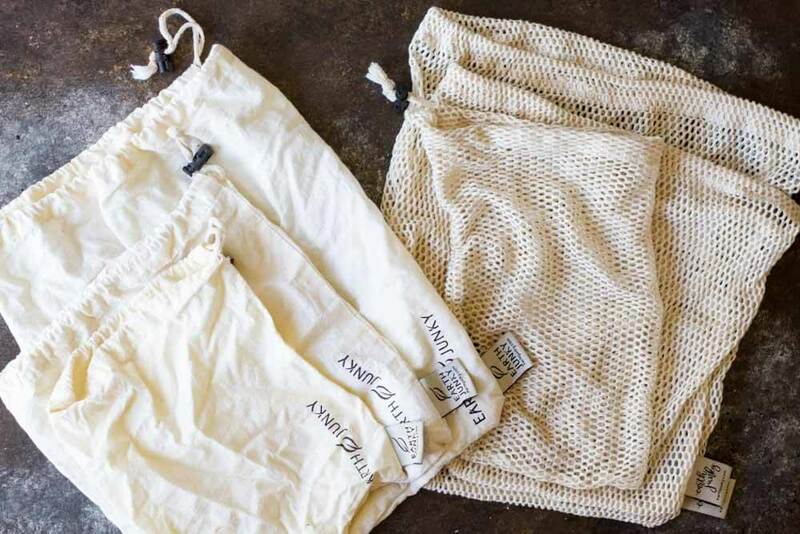 You could TOTALLY make your own with cotton bath towels. 5.Buy naked fruits and vegetables: Individually wrapped and pre-packaged produce is becoming very popular and may seem convenient. But this is not a very sustainable choice for us all. Buy loose veggies and fruits. Visit your local Farmer’s Markets and Farm Stands. This not only reduces your plastic footprint, but you are also supporting your local farmers who usually have healthier and more sustainable growing practices. 6. 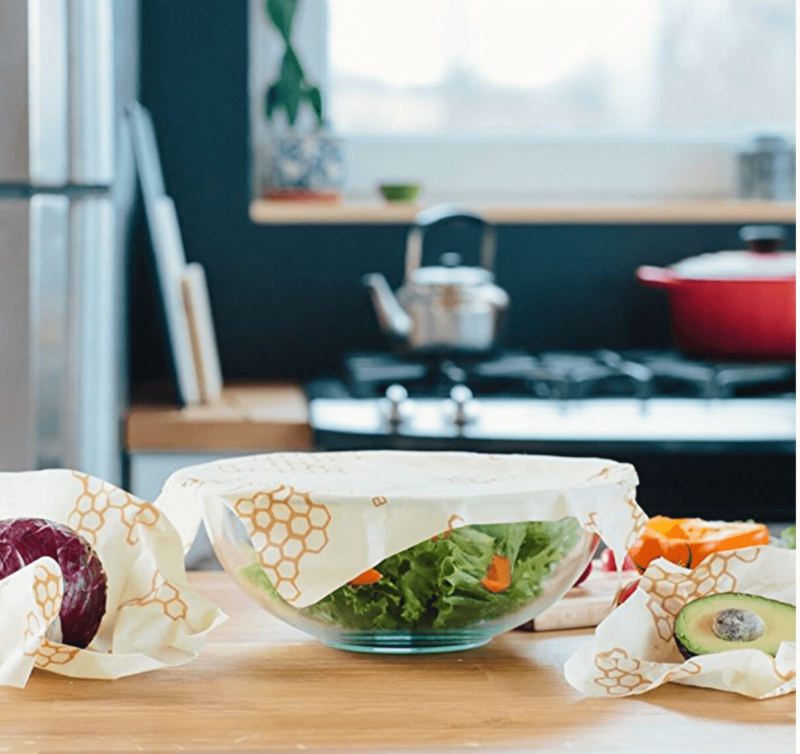 Skip the plastic wrap: Instead of covering your food with regular plastic wrap, store your food in glass storage containers or use Bee’s Wraps, which are reusable sheets of cotton coated in beeswax. I LOVE LOVE my Bee’s Wraps because you can use them for so many things. I use them to wrap avocado halves, sandwiches, snacks for Little One’s lunches, cheese in the fridge, and just about any little food thing that needs to be wrapped up. I eat a lot of cabbage, and I use the extra large Bee’s Wrap to protect the open, cut into side of my cabbage in the fridge. 7. Use glass storage containers: It’s taken me a while, but I’ve finally phased out all plastic storage containers in my kitchen and am using all glass storage containers. I’m a big fan or mason jars and I often save and reuse jars that I buy food in. 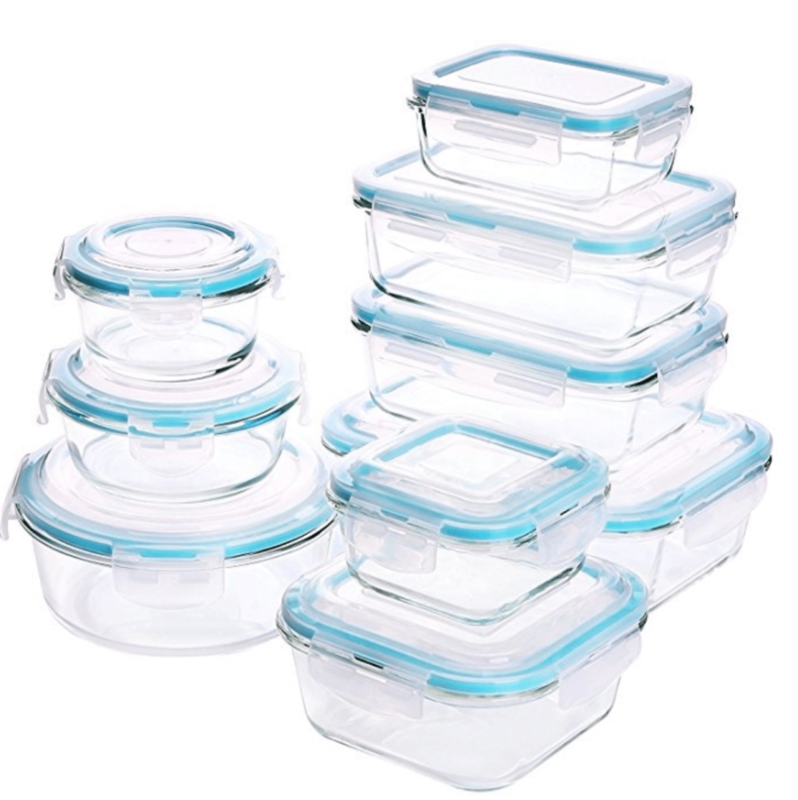 But investing in a big set of glass storage containers that can go straight from the fridge or freezer to the oven or toaster oven has been such a huge help in the kitchen. They are sturdy so I don’t worry about breaking them when I take them on the go They stack neatly in the fridge and freezer. I’ve found great deals on these little glass containers at our local TJ Maxx. 8. 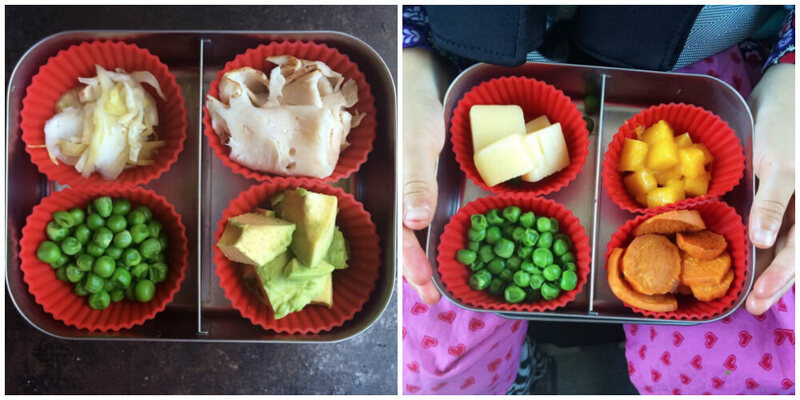 Use stainless steel lunch containers: I tend not to put glass in Little One’s lunch box. I invested in a really cute stainless steel lunch container that is durable, light weight, and convenient. I also have some smaller stainless steel containers for snacks. I use these tiny tins for condiments. They all stay closed in her lunch box and are easy to clean. 9. Skip the packaged food and buy in bulk: So many things come in plastic packaging. Take inventory of what you buy on a regular basis and try to find similar products in bulk. Many stores cater to folks who want to buy in bulk. I’ve been able to reduce much of what we buy in plastic by searching out other alternatives. I’ve also stopped buying certain things because of the packaging it comes in. Try to choose glass packaging when you can. You can buy cheese at the cheese counter and just bring your own Bee’s Wraps with you. Buy meat at the meat counter and have them wrap it in butcher paper. Buy bread from a local bakery and bring your own clothe bag to carry it away in. Every little choice helps. 10. Get creative: I know that I’ve linked to several products that I’ve invested in to help make my transitions from plastic easier. But you don’t really need all of these things. Look around and see what you already have. Mixing bowls with a plate on top is a great way to store leftovers in the fridge. Save larger glass jars that your food comes in from the grocery store. They make great storage jars for food. (anyone else have a massive collection of jars hanging out in their kitchen?) Placing a lid on your pot and storing leftovers right in the pot works too. Reheat right out of the fridge to save washing extra dishes. And don’t forget to check your local thrift stores, I find mason jars there all of the time. 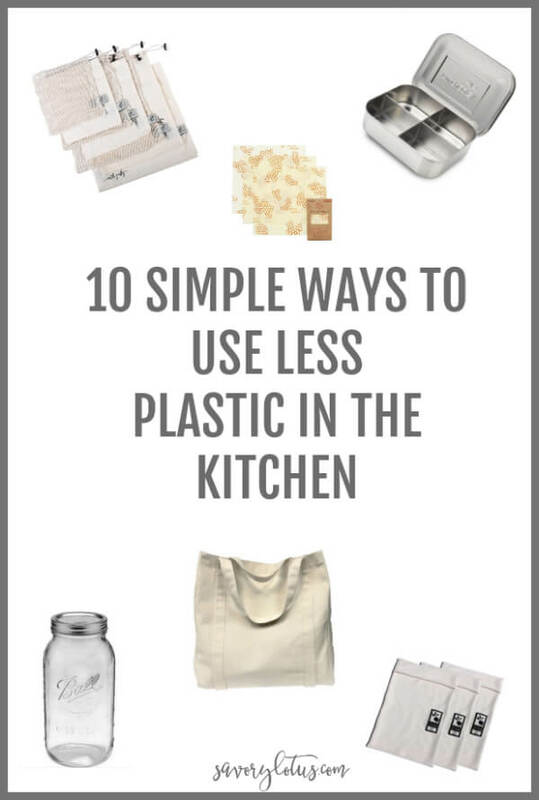 Now it’s your turn: Got any tips to share about how to use less plastic in the kitchen? Leave a comment below. I have seen that idea before. Yes, the market should have to deal with the waste. Hopefully this motivates them to reduce reduce reduce!! I know this is not kitchen related but when I wanted to reduce the amount of plastic coming through our house I realized that the biggest piece of plastic was laundry detergent and fabric softener. I started making my own, along with cleanser and spot remover. I have had the same fabric softener bottle for 3 years! Making my own products means I know what goes into it and they are natural. YES! Such a good point. I’ve been buying my detergent in bulk from the health food store, so I bring my own recycled bottle. But making your own is even better. 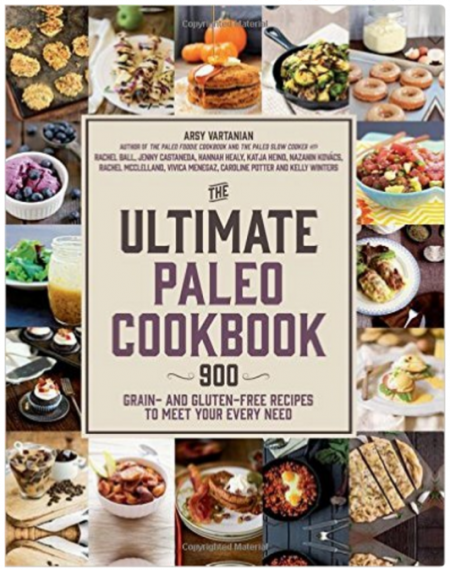 I just haven’t found a recipe that I like yet. I have been pining after bee wrap for sometime, I really want some!! And I think I am going to ask for some produce and bulk bags from my mom…you’re right, such an easy sewing project!! We use all our own bags, and sometimes fill my purse and everyone’s arms if I forget them in the car! LOL! I don’y buy plastic bottled drinks, and I would love to see more companies steer away from plastics for consumables…. Love this so much! It’s been a few years since we got rid of all the plastic in our kitchen and it’s been the best decision ever. I love bees wax and use them for many things. Thank you for this wonderful post! Thanks for this useful article! I’ve been trying to cut back on plastic. These are such great tips! We use a lot of mason jars for food storage and have some glass containers with lids too. I just got my first Bee’s Wraps and I think it’s such a great option to have. SO much better than the plastic alternative. Bee’s Wrap is so handy to have. And mason jars are the best, aren’t they. I’m pretty sure I own like a 100 of them!! Thank you for the shopping bag recs! I have been looking for something new! Thanks so much for this, I’ve been working my way through my kitchen trying to reduce waste!